Following that solid run-up, we saw the stock close at .0375, maintaining a vast majority of its advance. We’ll continue to keep a steady eye on KBLB, and look for it to maintain support above the .03-mark in order to keep us interested. 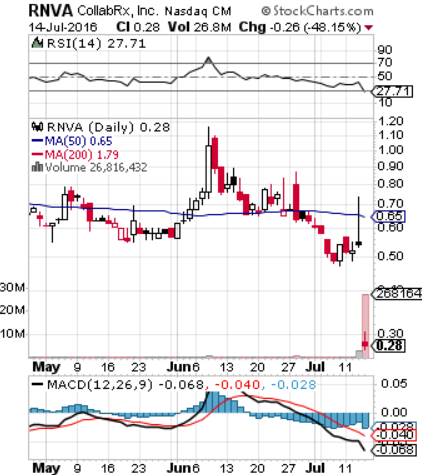 Rennova Health, Inc. RNVA – We have an interesting story unfolding with RNVA, and a potential rebound opportunity as well. After briefly cracking its 50DMA on Wednesday, the stock took a major gut punch yesterday as it gapped down immensely. It seems a bit of an overreaction after reading the PR that apparently catalyzed the selloff. The company announced yesterday that it had priced a public offering with the intent of raising upwards of $8.6M in capital, expected to close by Tuesday. They set the purchase price at .45, which is why a massive slide to less than .30 seemed disproportionate. We’ll be interested to see the activity in this now majorly-oversold stock in sessions to come. 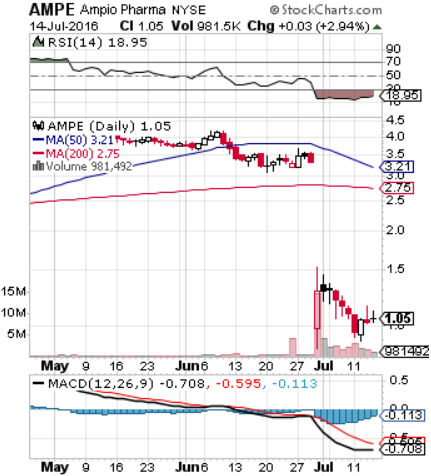 Ampio Pharmaceuticals, Inc. AMPE – Speaking of stocks that have recently gapped down hard and found new lows, we have AMPE hitting our bottom-play radar. Similar to the aforementioned play, the selloff occurred as a result of what some might construe as over-reactive. The company released data from a clinical study at the end of last month on its osteoarthritis injection treatment that was poorly-received. However, while the primary endpoints of the double-blind study were not met, the treatment was markedly effective in improving the patients with the most extreme cases of the condition. So the study was not a total loss, and the company made clear its intent to submit an FDA application for the treatment for those severely afflicted patients that were helped, and for whom no other non-surgical alternative exists. That’s why we’ll be keeping an eye on AMPE to continue to regain some of its lost ground, as it has done over the past few sessions. This entry was posted in Newsletters and tagged AMPE, COSI, FES, KBLB, KURA, MAXD, MFST, PPHM, RNVA, SPU by Blue Horseshoe Stocks. Bookmark the permalink.